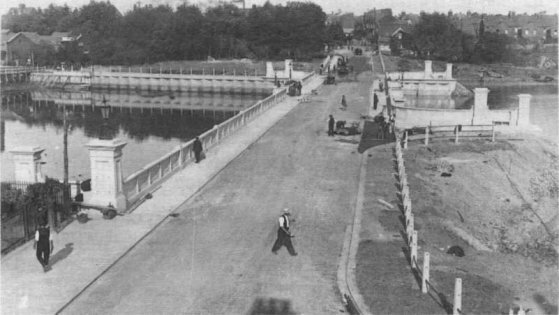 On July 13th 1921 the Westham Bridge was opened by RA Bolt and as you will see from the early photograph below the land on which the Melcombe Regis Bowls Club House now resides was at that time purely a hole in which all the bridge construction rubble and other material was tipped. This was to be filled in and on the 1st December 1924 a bowls club was authorised under the recommendation of the Pavilion Gardens & Amusements Committee of the former Weymouth & Melcombe Regis Borough Council. Work progressed -and this Committee authorised a sub-committee to arrange construction & provision of fencing and to advertise for turf. 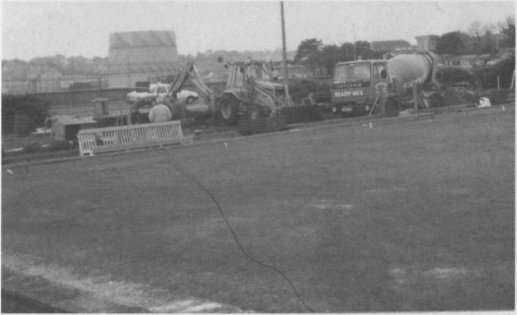 A total of 2,090-square yards of turf was supplied by GW Frogley at a cost of £172.8s.6p and became the foundation for the new bowling facility. 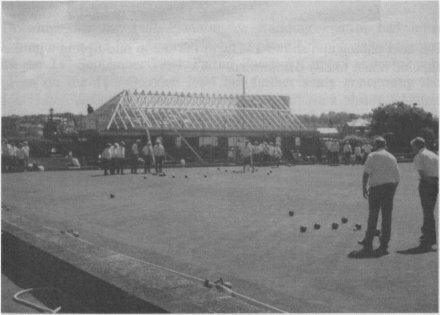 In 1925 the new bowling facility was mentioned in the Weymouth town guide. In April the Town Council recommended to fix the price of bowling season tickets at £1 at Greenhill and at 15/- at Melcombe Regis Gardens. On the 13th July the Borough Treasurer purchased 24 pairs of bowls for Melcombe Regis at 31/- a pair. In November the Mayor & several members of the Corporation drew attention to the fact that a new bowling green had been provided at Melcombe Regis Gardens at a total cost of £685. On the 3rd December the Borough Surveyor submitted plans and alternative estimates for the provision of a new bowling pavilion and the Council was recommended to approve plans for the new pavilion with bowls room & caretakers room at an estimated cost of £600. • At all times at least 2-rinks were kept available for visitors if required. • During August the club was to arrange fortnightly matches with visitors. 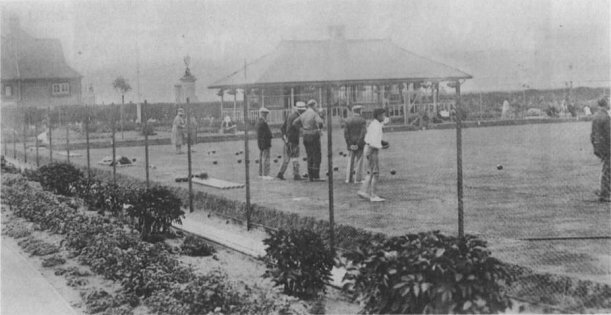 Another early photograph (below) shows the structure of the original bowling pavilion that had been constructed and the green in full use during the summer of 1926. On 19th June 1926 the newly formed Melcombe Regis BC held its first match against Dorchester. At the conclusion of the match the Melcombe Regis captain, A Dennis, thanked the Dorchester team for the game and remarked that as yet the Melcombe Regis club was only a baby but a healthy one that was cutting its teeth very quickly, so quickly in fact that before long he was sure that it would begin to bite. In 1927 the newly formed bowls club entered the South Dorset League. 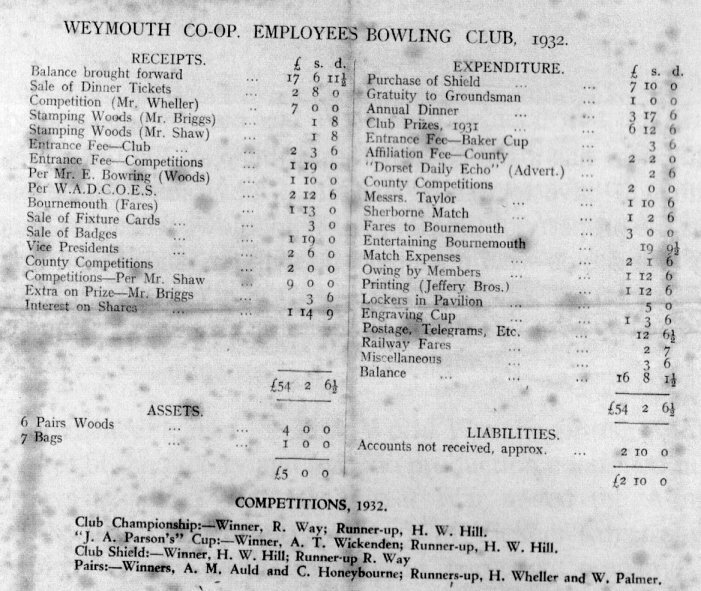 A major employer in the town at that time was the Cooperative Society and a Co-Op Society Employees Bowls Club was formed. Permission was given by the Council for them to use the Melcombe Regis green in 1930. 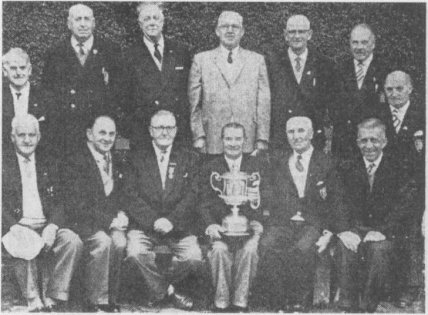 Both clubs flourished on the green and in the summer of 1957 the Captain of the Melcombe Regis club, Charlie Sampson, lead his team to a fine double by winning both the Dorset County Cup for the first time and the South Dorset Baker Cup. By the late 60's the original wooden pavilion structure as seen in the photograph above had began to decay but remained in use. In 1962 the Weymouth Co-Op, the Southern Section County League title holders after a play off between themselves and Bridport played the Northern Section holders Gillingham to decide the winners of the Dorset County League Challenge Cup. The final was played at Dorchester Borough Gardens and in a tight game with an exciting finish the Weymouth Co-Op emerged the winners by 2-shots (55 -53). The Cup was presented to GH Cox the Captain of the Weymouth Co-Op by Major AA Matham. The following photograph shows the victorious team with their trophy. In 1976 a Ladies section of the Melcombe Regis club was formed. There was only 1-changing room in the wooden pavilion and the toilet facilities were inadequate. Representation was made to the Council and in 1978 plans were drawn up by the Council architect but not pursued by the Council because of financial restraints. In 1981 representatives of the 2-clubs were asked to attend a meeting with the Council to be informed that the Council no longer intended to steward the green. The clubs were to be responsible and could retain all monies taken. For this the clubs had to pay a franchise fee of £400. The 2-clubs agreed to set up a Management Committee made up of 3-members from each club & 1-member of the Melcombe Ladies section. This organisation was given the name MELCO. It was made responsible for administering the green ,pavilion & setting fees. Non-club members had to pay fees set by the Council and there was a Council stipulation that 2-rinks be kept available for members of the public. Numerous new approaches made to the Council & the Sports Advisory Council for new facilities, all to no avail. For many years the future of the club remained in doubt as many Councillors saw it as a prime site ripe for selling off to a developer. In April 1991 the Town Plan was produced and showed the facility remaining on its present site. Continuing financial restrictions and reduction in skilled grounds men resulted in deterioration of the green. Despite continuing meetings with Council officials the situation did not improve. In November 1991 MELCO were informed that a consortium of local developers were looking to build an indoor bowls facility with a new pavilion at the North end of the car park that would serve both the indoor & outdoor clubs. This was supported by MELCO but the Council demand for a high rate of return from the developers was not acceptable and MELCO were again left on its own with regard to a new pavilion. On the 5th February 1993 MELCO were informed that if they carried out green maintenance a loan of Â£50,000 could be made available and that the money saved by the Council each year could be used to repay the loan until the debt was discharged. MELCO would be required to carry out all preparatory work such as architectural design, seeking planning permission, obtaining builders estimates etc. The plan was deferred by the Council for 12-months because of uncertainty as to whether Westham Bridge would be reopened for traffic. In April 1993 MELCO tried to force the issue by applying for outline planning permission for a new pavilion. As time progressed various plans were put forward and rejected by the Council with 1-Councillor even wanting the club to be removed to Lodmoor. 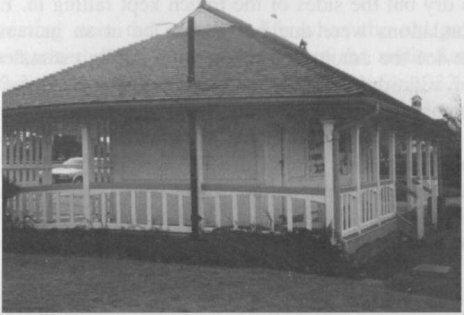 The Mayor at the time, Councillor Martindale, then forced the issue of the new pavilion by stating that unless the Council made its mind up he would have the original wooden pavilion condemned by the Health & Environment Dept. Eventually Councillor Gainey proposed that 'not withstanding the views of the Chief Planning Officer and the limited capital funds available the officers be authorised to undertake further survey work and enter inti-discussions with MELCO concerning the construction of a new pavilion to the west of the existing pavilion'. This resolution was passed. MELCO tried hard to obtain dedicated parking for the bowls club but the Council would not yield on the matter. Amended plans were then submitted for outline planning permission on the 4th May 1994 and these were passed on the 29th June 1994. Discussions continued with the Council on the matter of the legal documents required for the loan and the licence for the holding and maintenance of the pavilion & green. Mr G Mould was appointed green keeper and he commenced work on the green in September 1994. Legal documents were issued by the Council but were entitled MELCO Bowling Club. When the Council Deputy Chief Executive was informed that there was no such club he responded by saying the loan could only be made to 1-club. The 2-clubs (Melcombe Regis & Weymouth Co-Op) decided to amalgamate on the 19th January 1995. At a special AGM the new club was agreed to be called Weymouth & Melcombe Regis Bowls Club. Drawings for the Full Planning & Building control had been submitted on the 16lh August 1994 and planning approval was given on the 21st September 1994. Partial Building Control approval was given on the 11th October 1994 but further study concerning the foundation design was required as the Council were unsure whether conventional strip foundations would bear the load with the whole area being reclaimed land. MELCO had to fund soil sample borings at a cost of £2,000.00 the results of which showed that load bearing material did exist and full approval was given with the addition of extra reinforcing to the foundations at the eastern end of the site on the 22nd December 1994. Final drawings showing the amended foundation work were sent out and the tendering process selected HR & JC Lawes to undertake the construction work. The costs of the work were now £64,500.00 -£14,500.00 in excess of the original loan figure of £50,000.00. The Council agreed to loan an addition £10,000.00 leaving MELCO to fund the extra £4,500.00. Contracts were drawn up, placed and signed by MELCO on the 2nd March 1995 with a start date of 6th March 1995. The old pavilion originally built in 1926, as shown in the following picture, was demolished during March with as many of the old roof tiles being saved to be reused on the new pavilion in order to save costs. The next photograph shows a view of the site in mid-Spring with the old club house totally demolished. Excavations for the main drain then commenced and problems were encountered as water poured in and the sides of the hole collapsed. Trial excavations were made at the east & west end of the building. Similar problems were encountered at the west end. At the eastern end it was dry but the sides of the trench kept falling in. Eventually all the foundations were dug but had to be at an increased depth requiring twice the amount of concrete originally estimated and the removal of additional spoilage at an additional cost of £6,677.83. Another increase in the loan was requested and granted. The original completion date of the 30th June 1995 was delayed and the following photograph shows a partially completed new club house and the green in use. To enable the green to be used the club had to fund the hire of a Portakabin and 2-portable lavatories. The new pavilion was available for partial use in the 3rd week of July and club members assisted the club by providing carpeting & crockery and the fitting out of the bar, kitchen & dressing rooms all at cost price. The new pavilion became fully functional on the 14th August 1995. On the 27th August 1995 the club members and their President Albert Munden welcomed the Mayor, Councillor Arthur Sheppard, and his wife who officially opened the club. statement for those times when it was £.s.d and before inflation took hold. This is detailed in the reproduction shown below. The club has continued to survive and make full use of the facilities the new pavilion provides. 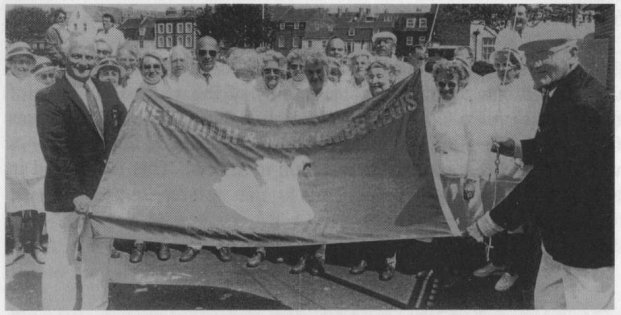 On the 11th May 1997 a new flag pole was donated to the club by Percy Hossack and the Weymouth & Melcombe Regis Bowls Club was presented with a new club flag that was donated by Jim Chislett. The following picture shows the presentation of the flag attached to the new flag pole with P Hossack on the left and J Chislett on the right. The club now has a settled home until the year 2023 at which time the club will have to remind itself that the green and the pavilion remains the property of the Council. Who knows what the Council of the day will decide what it wants to do with the land at that time.